Find the rate of change of a function from to . At what time does the function have a slope of ? Round to the nearest hundredth. on the first term. We need to also recall that the derivative of is . Applying these rules we get the following derivative. We're looking for the time the slope is , so we have to set the derivative (which gives you slope) equal to . At this point you can use a graphing calculator to graph the function , and trace the graph to find the x value that results in a y value of . The positive solution rounded to the nearest hundredth is . A rectangle has a length of four feet and a width of six feet. If the width of the rectangle increases at a rate of , how fast is the area of the rectangle increasing? The area of the rectangle does not change. Because the width of the rectangle is increases at a rate of , . Since the length of the rectangle does not change with respect to time, . and are given to us as 4 feet and 6 feet respectively . Therefore the area of this rectangle changes at a rate of when the width of the rectangle is increasing by . You are looking at a balloon that is away. 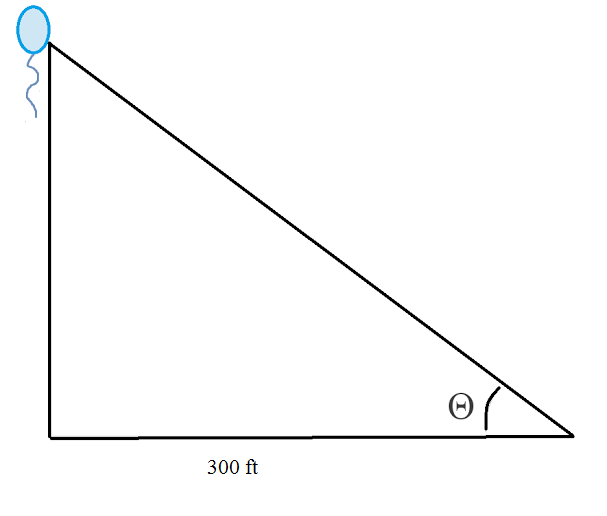 If the height of the balloon is increasing at a rate of , at what rate is the angle of inclination of your position to the balloon increasing after seconds? We are asked to find . We are given and since is constant, we know that the height of the balloon is given by . Therefore, at we know that the height of the balloon is . Boat leaves a port at noon traveling . At the same time, boat leaves the port traveling east at . At what rate is the distance between the two boats changing at ? We need to find when . Find if the radius of a spherical balloon is increasing at a rate of per second. We can solve by utilizing the formula for the average rate of change: .